Our Large Inkjet Bond Wide-Format Paper Rolls are American Made 20lb Roll Bond Large Format Inkjet Papers Printing Size Roll Recommended for HP, Canon, Epson, Oce all 2 inch core 22", 24", 30",24", 36", 42" Large Format Printer Paper or Copier Machine use in America. The paper whiteness 92 Bright and allows for crisp, clear ink acceptance on our 0730 Wide Format Wide-Format Paper Rolls. Our monochrome inkjet bonds are extensively tested for performance and quality. You will see a wide-format-paper-roll consistency of superb image quality from roll to roll each time you order our paper. American Paper; each roll is bagged in water proof thick plastic bags and thick boxes giving travel quality and security. Fresh from the mill. Core Size: 2.0" Basis Click on drop-down box (to the right of the photo above) to see all sizes. Perfect for use in Hewlett-Packard, Canon, Oce, Epson, any wide format inkjet plotter with a 2 inch paper core. 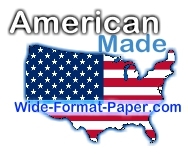 American Made Wide Format CAD Inkjet Paper for 131 years. Image Quality : Superior image quality. Smooth Surface : Allows for crisp, clear ink acceptance. Wide Format Inkjet Media, our Wide Format Paper Rolls, works best in controlled operating conditions. Recommended operating conditions are: Relative Humidity 20-70% and Temperature 65-85°F. Dry time for your image will vary depending on printer, ink volume and environmental conditions of your plotting area. Always store your Wide Format Inkjet Media or your engineering paper rolls in a cool dry area. It is best to keep your storage conditions within the same guidelines as “Operating Conditions” stated above. If your storage conditions are not similar to operating conditions, we recommend that you allow the Wide Format Media to acclimate to the operating conditions before commencing the printing process. Inkjet printing should be done on the preferred side of your Wide Format Paper Rolls. Preferred side is always on the outside of the roll unless otherwise noted on package. Be sure to handle Wide Format Inkjet Media from the edges. Do not handle within the image area. Dirt and oils from your hands can cause inks to repel, resulting in poor imaging. Always return unused media to its original packaging. Over-laminates can provide effective protection of your image from moisture and limited protection from UV fading of the inks. Another reason to use a laminate is to add or diminish gloss on your final image output. Both hot and cold laminates are available with varying results. It is important that your image be completely dry before laminating. Failure to wait until the image is dry may cause your print to de-laminate in time. Find us on Google+ Steve A. Our Wide Format Inkjet Bond is derived from wood pulp base and is not considered archival. Really thank you! Fantastic. They did roll cheap and look great. Large arranged roll for our print. This is the right place. Thank you wide-format-paper com - without you we would have never found the right size for that machine. Much faster than ordering from any LARGE mega online company that carries everything from calculators to water cups. These people care. A+++ vendor. They have helped me in some tight spots so we have been with them for over two years now. We buy wide format paper rolls here. Good paper at better prices. You have great prices or Epson printer has never been happier. Click the button below to add the Wide-Format Roll Paper Saver to your wish list.